I managed to check on one of my native bee houses at just the right moment today. If you have never seen a mason bee leave it's cocoon before, then you need to see this. It is similar to watching a bird hatch from an egg. So similar, in fact, that you will often hear me refer to the process as a bee "hatching". A female blue orchard mason bee emerging from a cocoon. Bird nest inside a bee house. Nesting tubes pulled from a native bee house by a bird attempting to nest. A silly little bird (probably a house wren) decided to build a nest inside the bee house, directly on top of my nesting materials. Not only that, but the bird managed to throw about half of my nesting tubes on the ground, as well as all of the cocoons that had been on top of the tubes! 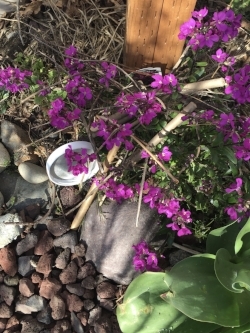 I managed to located the lid that the cocoons were resting in (prior to be tossed out the front door by Mr. or Mrs. Bird) and spent the next hour picking cocoons out of my rock path and the plants below the house. I removed the nest, replaced the tubes, put the cocoons back on top, and covered the face with chicken wire. So far so good, and now the bees are beginning to make their appearance!